Transformation, liberation, change, transition, rebirth, renewal. A symbol of renewal and rebirth, Cicada sweeps away the past, setting upon a clear new pathway. 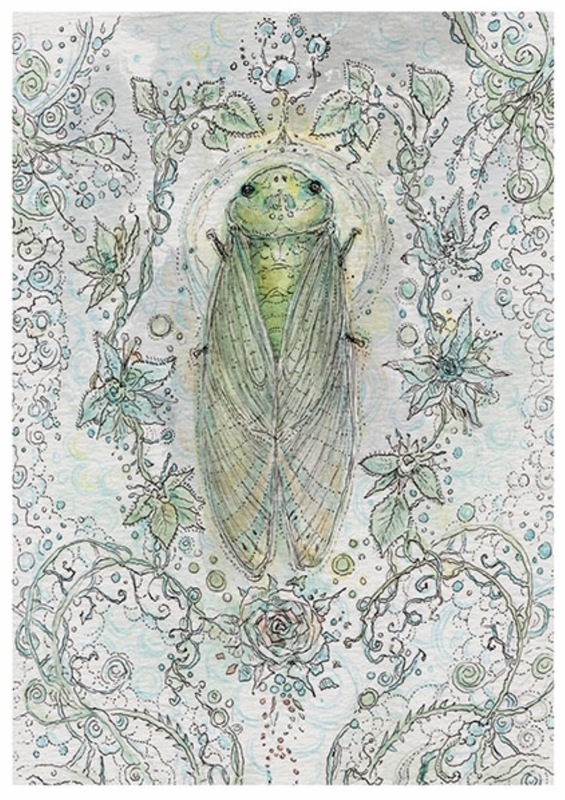 Having a transformative life cycle, Cicada assists in helping to work through spiritual changes, and to move from an ending of a cycle into a fresh new beginning. In the creation of the new healthy you, the clearing of obstacles allows your energy to move forward. Life is permanently changing, and change brings forth creativity, new life, and new perspective. In the deepest reaches of space, a strong celestial bird grips a comet as it hurtles through space, bringing light to the darkness and burning through all of the clouds and obstacles in its pathway. Nothing can stand in its way, as it charges forward, a force of nature that is absolute on its journey. When this card appears in a reading, it is advising you that the time has come for careful, logical, thought and objectivity. An opportunity for a new way of thinking, a deeper understanding and clarity is being offered to you. To reach it, you need to cut away all the “fluff” and nonsense that is confusing the issue and make ethical, honest thinking your priority. What a powerful week we have in store! Full Moons always garner a great deal of attention, but this one comes with a great deal of hype. On the 31st, we will have a Full Moon Total Lunar Eclipse in the sign of Leo. Pretty much, one would have to be living under a rock, to not have heard it mentioned in some way. It will also be a Supermoon, meaning it will be exceptionally close to the earth, and it will be a Blue Moon, meaning it is the second Full Moon of the calendar month. That is quite a mouthful when you try to fit all those adjectives in one sentence. Only a few short minutes after the Full Moon is exact, Mercury will move into the sign of Aquarius. I have relocated my Weekly Tarot Guidance and my Love and Finance Tarot Guidance; to find them, click here for further directions.